Finally caught up on work, I took a leisurely break on my way home from a meeting in Shoreline this morning at Evergreen Washelli Memorial Park. 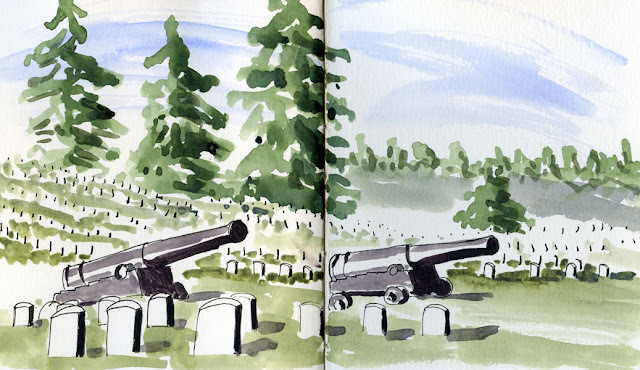 Back in April was the first time I drove by the war memorial section of the cemetery. Completely daunted by the rows and rows of identical white markers, I had no idea how to approach such a sketch. Today when I drove around the area again, I still didn’t have a clue, but the lovely day was inviting, as was the serenity. I’m not completely happy with the way the sketch turned out, but it gives me something to use as a baseline for the next time I attempt it. Driving out of the park, I spotted a flock of Canada geese grazing in the grass and sipping from puddles. 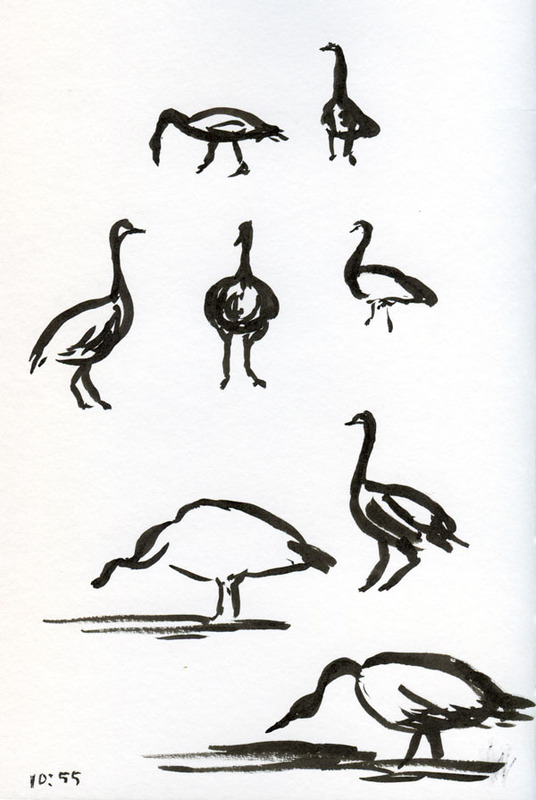 I pulled over and quietly walked over to them, brush pen in hand. 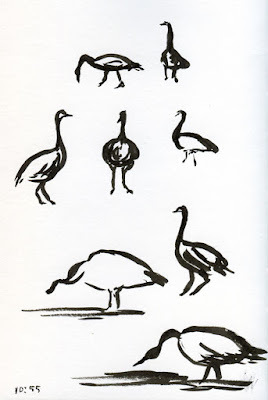 Capturing that graceful S-shaped curve in a goose’s neck as it bent to take a drink – that made me happy! 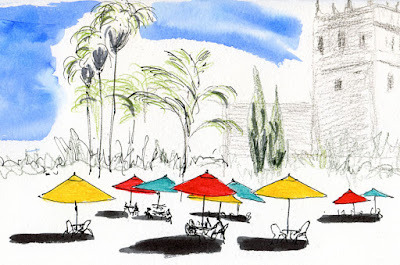 With all my travel this month, I’m busier than usual with work this week, trying to catch up (or keep ahead). 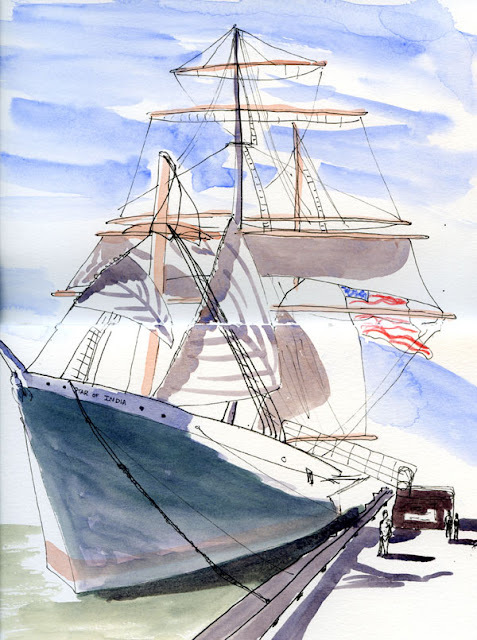 The smoky air from the wildfires has finally cleared, so it was very tempting to sneak out for a sketch, but I resisted. Instead, I took a 15-minute break to sketch another hummingbird from my World Wildlife Fund calendar. Its tiny wings and tail are beating so fast in the photo that they are a mere blur. 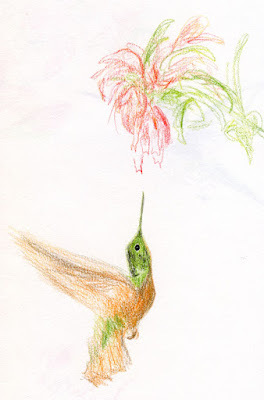 The chestnut-breasted coronet, says the calendar, “defends its feeding territory pugnaciously.” I’ve seen nature programs confirming that hummers, sweet and delicate as they may appear, are vicious fighters. In fact, I’ve seen evidence of that myself among the few hummers we occasionally see from our backyard. Sketching it was a good break. I felt invigorated by its pugnacious energy. Around this time of year each year, I start seeing signs of the season of Denial. That’s when I’m not ready to see summer come to an end, but the trees keep reminding me that fall is closer than I want to believe it is. This year, however, I’m OK with letting summer go, if only because it was one of the longest on record. Since June we’ve enjoyed week after week of sunshine, clear skies, and record-breaking heat and consecutive rainless days. This isn’t as good as it sounds – drought and treacherous wildfires continue to devastate the region. Even as I feel terrible for the loss of life and damage this weather has caused, I’m also grateful for and joyful about the best outdoor-sketching season ever. 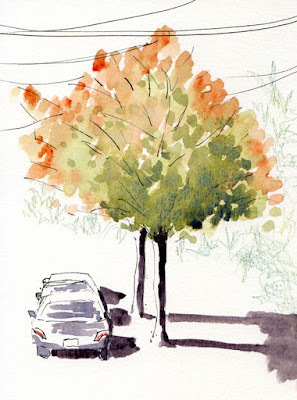 I’ve been seeing trees tinged with yellow and orange for several weeks now. Instead of turning, some look downright scorched. These maples in my neighborhood near Lake City Way are still mostly green, but the tips of the branches have that tired, faded look. Weary of all the heat and sun, they’re ready for some good ol’ Pacific Northwest rain. So am I.
It’s a lazy Sunday afternoon (it’s been so long since I’ve had one, I almost didn’t recognize it) – my favorite time to experiment with different media or tools. 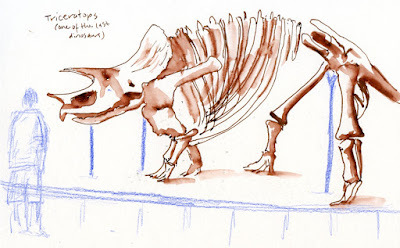 The other day I was digging through my supplies looking for something else when I stumbled upon my Koh-i-Noor Tri-Tone colored pencils. I experimented with them for a while last year but eventually took them out of my everyday-carry bag. They’re so much fun – it’s time to put a few back in. 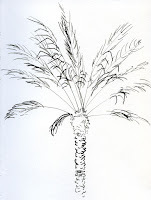 Today I used them in my studio to draw from a calendar photo. 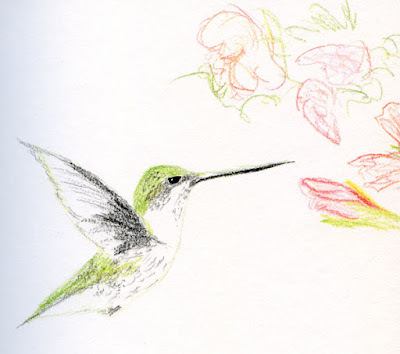 Only two colored pencils were used: one with green/yellow hues and one with red/pink/yellow hues (the black lines were made with a Cretacolor Nero pencil, with a dot of ink for the eye). Since the tri-tone colors are mixed up within the single pencil lead, you can’t control which color you’ll get on any particular line. They all blend into an interesting mix. 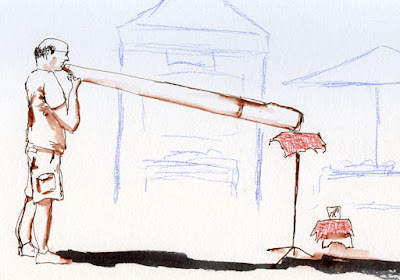 I’ve sketched quite a few buskers in the past few years, but the one I sketched this morning at the University District Farmers Market was a first: a didgeridoo player! 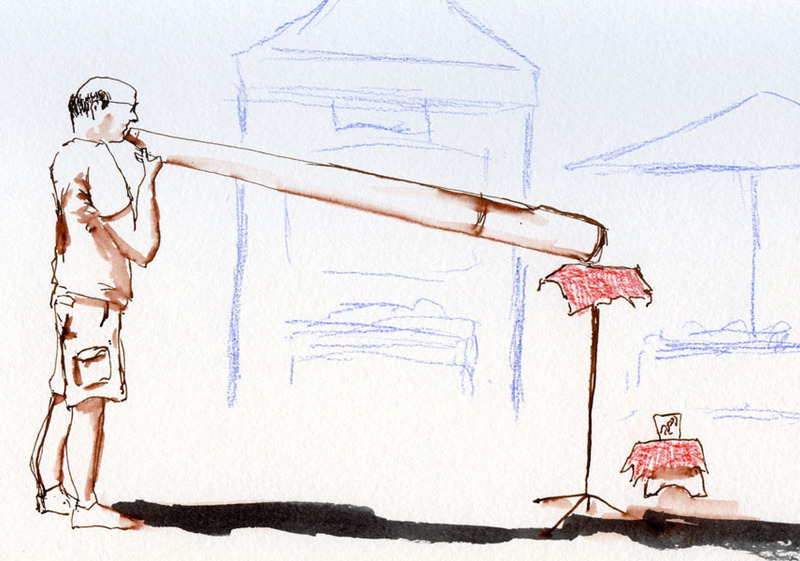 I sized up the didgeridoo twice to make sure I got the proportion right – it really was a bit longer than the player was tall. 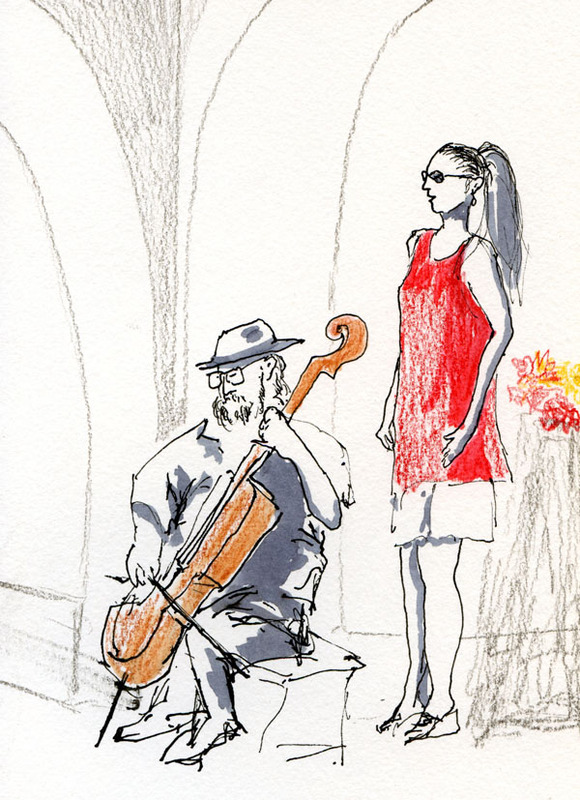 It must be a tiring instrument to play because the musician kept taking lengthy breaks between songs. 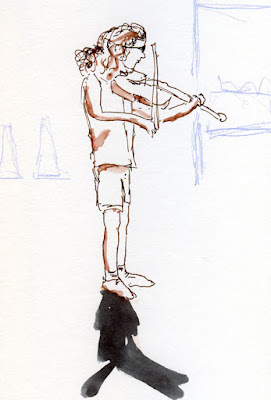 I wish I had captured the young classical violinist more accurately – this preteen girl was much cuter than the way she looks in my sketch. Actually, the most notable part about this sketch is her shadow. 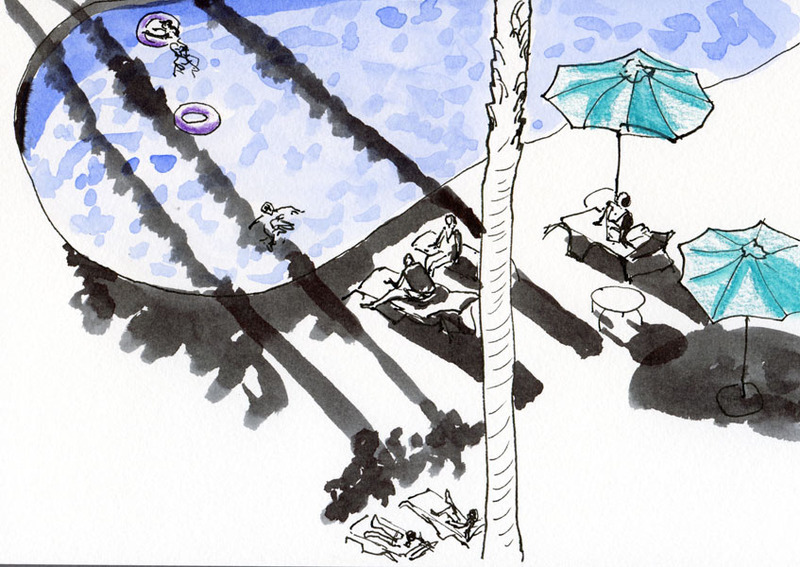 You’ll notice that it’s coming out toward me, which means I was looking directly into the sun as I sketched. Like most sketchers, I don’t like sketching with the sun in my eyes, but today, the sun is an eerie orange ball that you could look at with unshaded eyes. That’s because of the heavy layer of smoke in the air from all the wildfires still out of control in central and eastern Washington (as well as several other western states). We’re used to overcast skies here, but today’s sky looks very different and spooky. Three firefighters lost their lives this week battling those blazes. Proposing a sketch outing at a location I haven’t been to before can be risky, but the photos looked inviting, so I took a chance on Bradner Gardens Park. 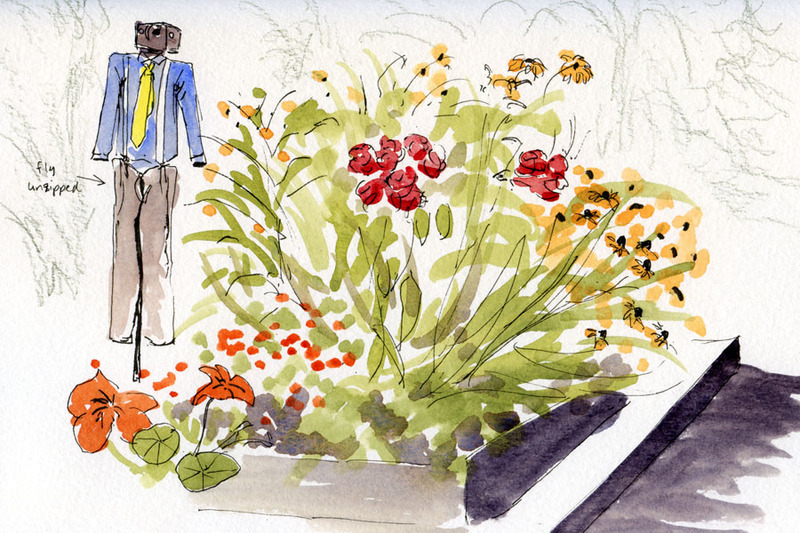 Along with the other Friday sketchers, I was delighted to find this well-designed pea patch to be full of surprises. The gardeners who work this pea patch have so many luscious flowers and vegetables growing that I wandered for quite a while trying to choose one for my last sketch. 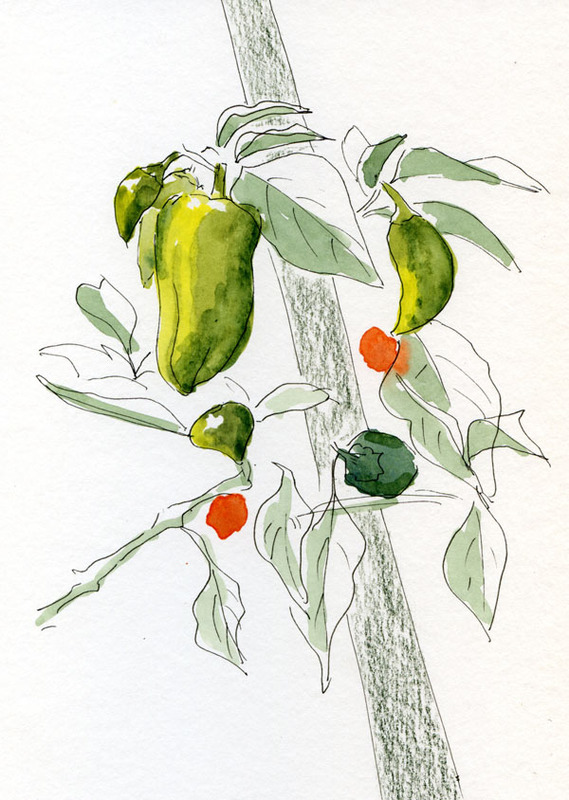 The gorgeous green peppers near the restroom caught my eye – the shapes and colors so vibrant. Speaking of the restroom, I have to show you the surprise I found there. From the outside, it looks like your typical drab, unattractive concrete box often found in city parks. 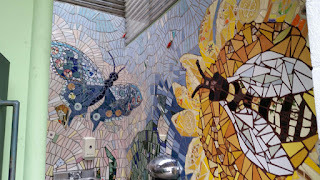 But inside was a mosaic covering the walls with huge insects and other garden motifs. The wall placard said that the mosaic was made and donated by Friends of Bradner Gardens volunteers. 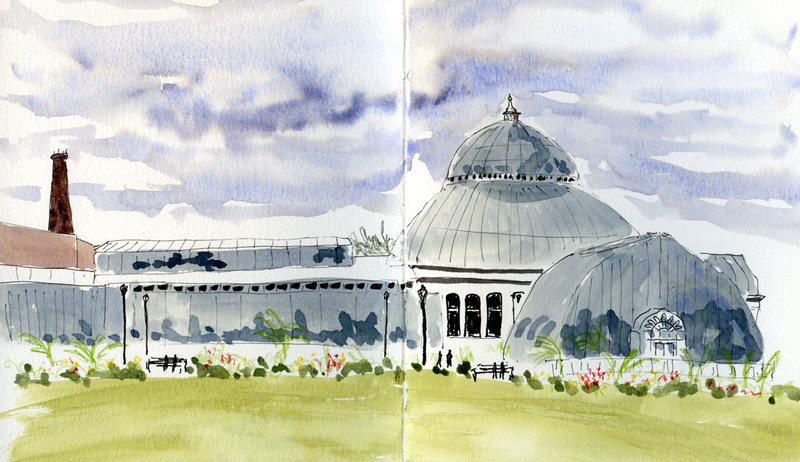 Although technically this last sketch (at right) wasn’t made in the gardens, I finished it this morning before the others arrived for the meetup, so I’ll include it in this post. Wandering around the gardens’ periphery, construction noise got my attention, so I walked around the block to see what was going on. 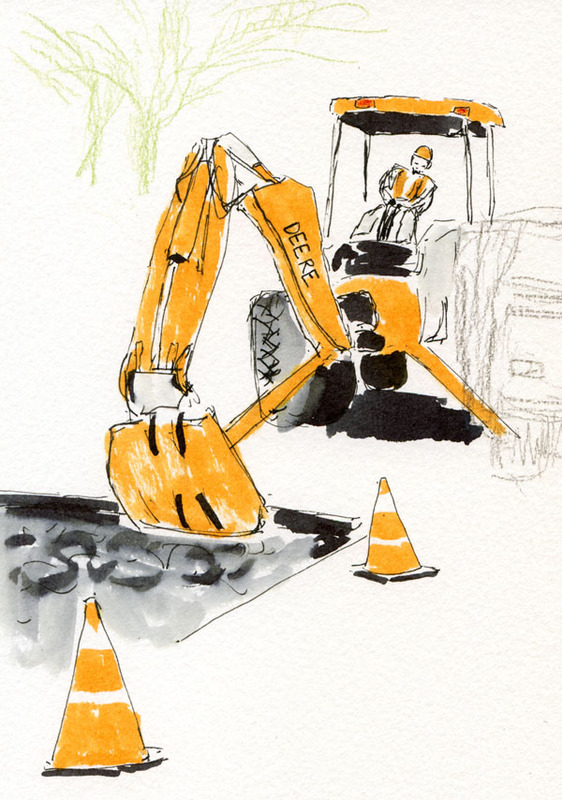 A backhoe was busy digging a hole in the street. I could tell that the work was nearly done, so I had to hurry, and sure enough, it finished a few minutes later. The funny part was that afterwards while I was still standing there coloring the backhoe, the operator came over to see what I was doing. 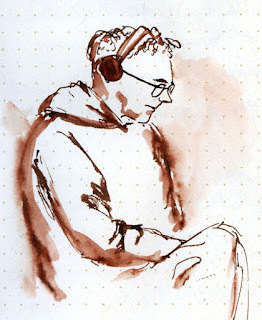 Concerned that I was a neighbor taking notes so that I could complain about the dust or noise, he seemed relieved that I was only sketching. He laughed and said I had made him look skinnier than he really is! 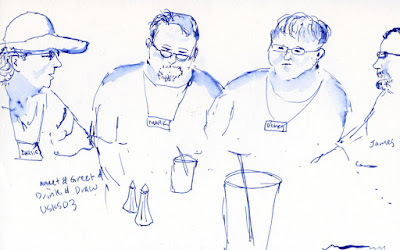 As you know, I don’t have much of a track record for sketching my meals, even when I have every intention to do so. Unlike many sketchers who routinely sketch their food, I’m always too hungry and impatient. During dinner one evening at an Italian restaurant in Minneapolis, however, I came as close to sketching a meal as I will probably ever come (below, right). 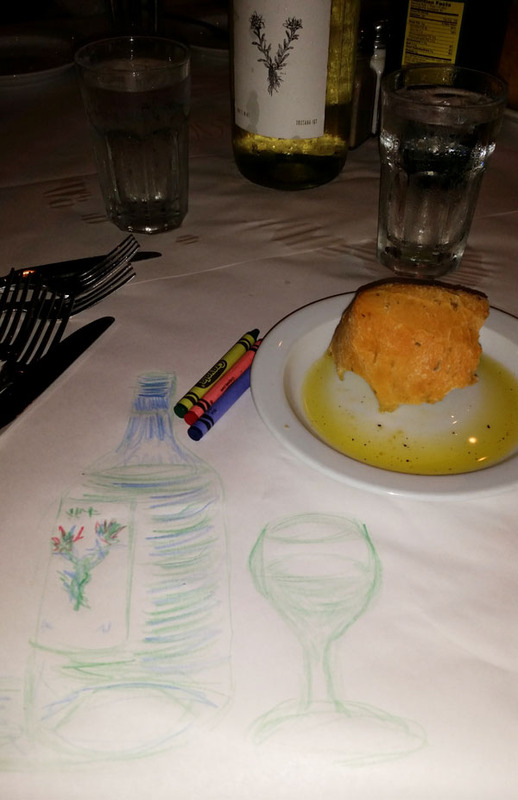 The table was covered with white paper, the crayons were provided, and the food hadn’t yet arrived: the ideal setup for sketching the wine. To round out this last post of trip randomness, I’ll end with two sketches of fellow travelers. 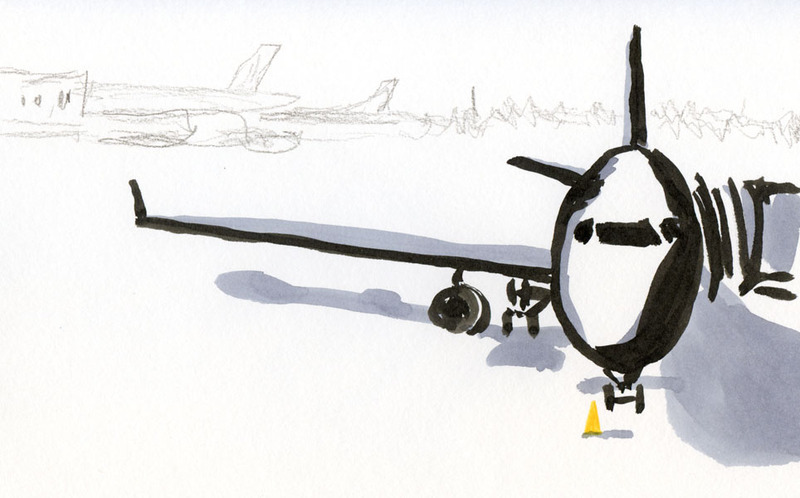 Instead of the mandatory airport sketch of a plane waiting at the gate, the poor, tired dude (above) trying to nap at MSP was a lot more fun to sketch. 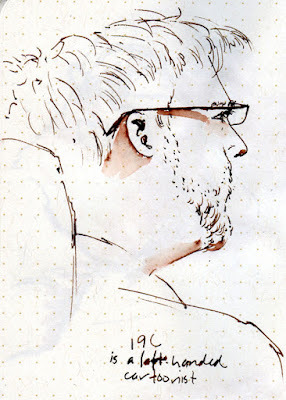 Once aboard Sun Country flight 283, I did my usual sketches of nearby passengers. 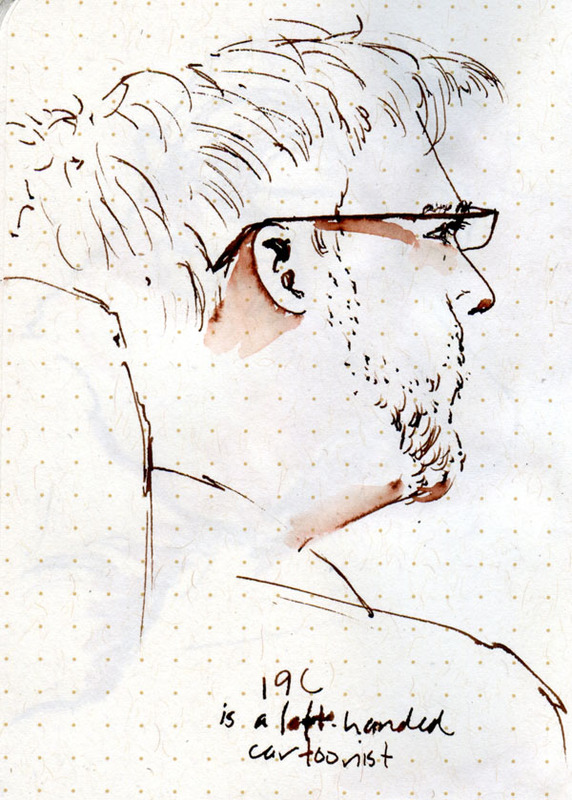 The guy in seat 19C (below) was noteworthy mainly because of what I eventually learned about him: He’s a sketcher, too (a left-handed cartoonist, at that). The main purpose of our trip to Minnesota was Greg’s family’s annual reunion picnic, this time held in the town of St. Charles about a hundred miles south of the Twin Cities. 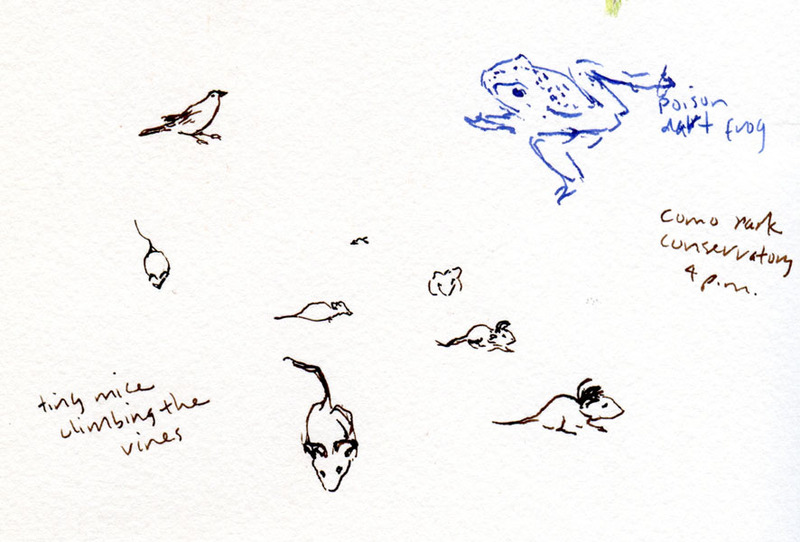 I did resist sketching during the picnic (difficult, yes, but we all know the sacrifices we make for family). 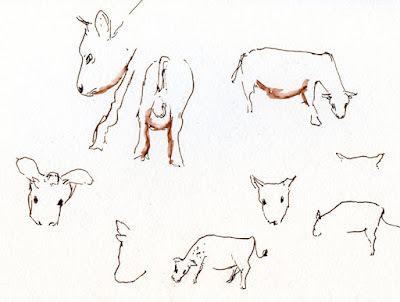 However, I got my opportunity for sketching immediately following the picnic, when we were invited to visit a nearby dairy farm belonging to one of his relatives. 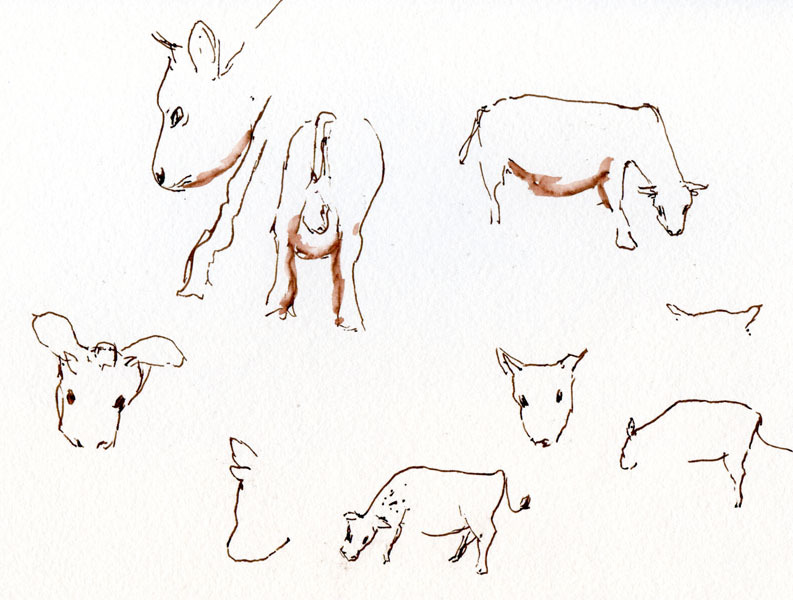 While Pam, the dairy farmer, gave us a tour of her artisanal cheese-making operation, I kept looking around for cows to sketch. 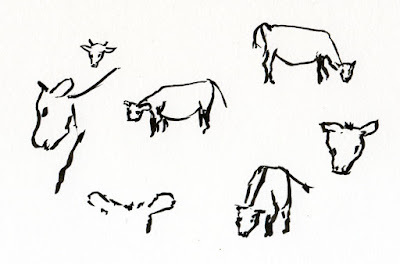 At first they were all grazing on the far end of the field, out of sight. But as the tour of the farm continued, I lagged behind a bit and was rewarded. Three or four cows wandered out of their barn, and a couple of them even walked right up to the fence where I stood, staring at me. 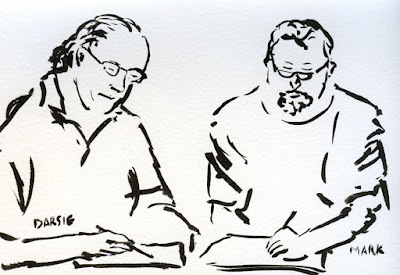 On auto-pilot, I pulled out my usual Sailor fude pen, but after unsuccessfully trying to capture their constant movements with that, I realized I was using the wrong tool. 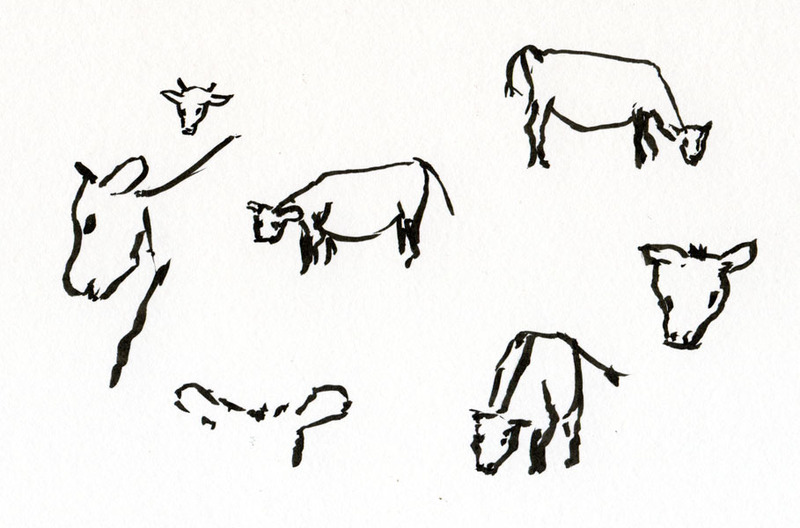 I then pulled out a brush pen, and this time I had slightly better luck making bovine gesture sketches. The last two sketches are both part of the exterior décor of the Country Inn & Suites where we stayed in Bloomington. 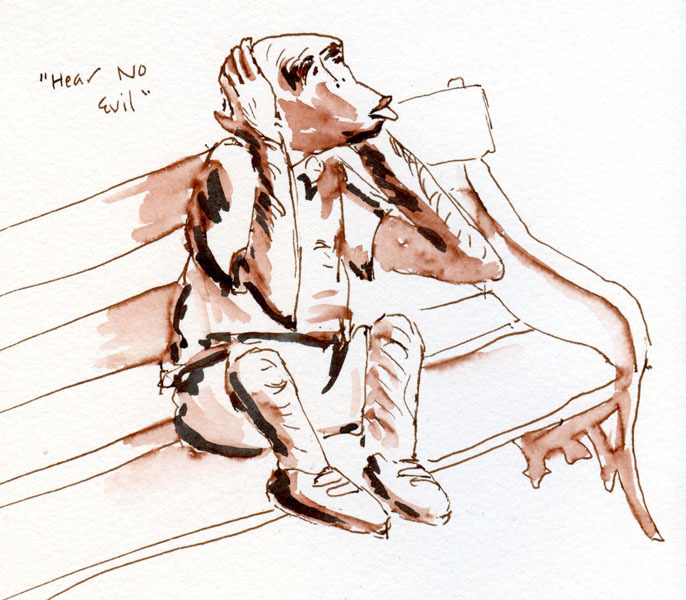 “Hear No Evil” is a bronze sculpture of a clothed chimp attached to a bench. I kept thinking his brothers (who neither see nor speak evil) should be nearby, but I never found them. Strangely random. 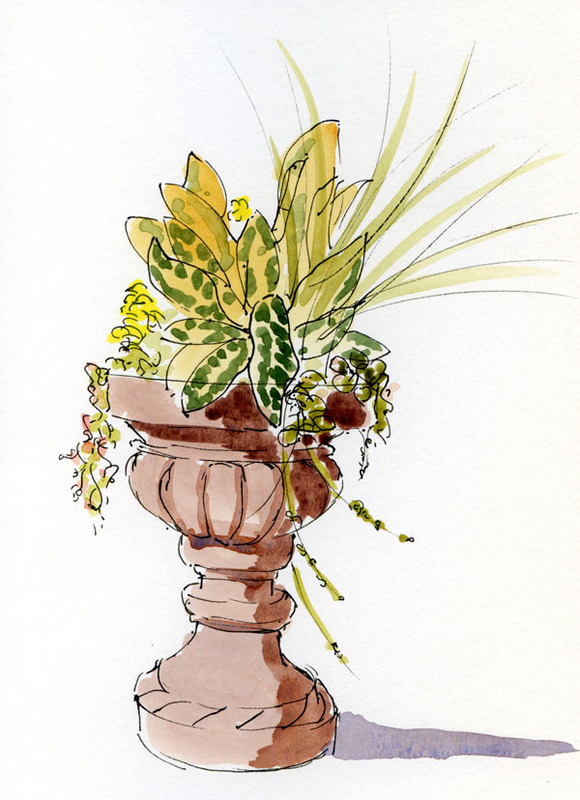 Less random were the large urns of colorful leaves and flowers on either side of the hotel’s main entrance. 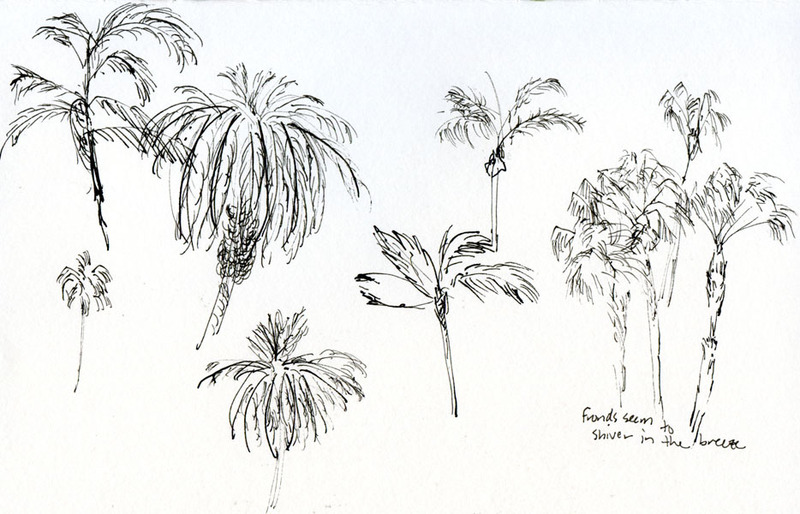 Each morning while I waited for Greg to shower, my routine was to get coffee from the lobby and then look for something to sketch nearby. 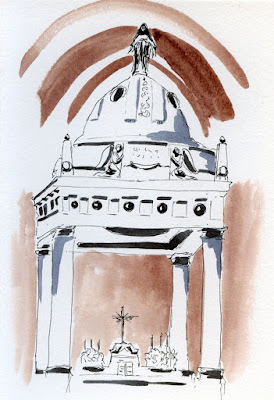 One morning I drew the urn arrangement; the next day I painted it. 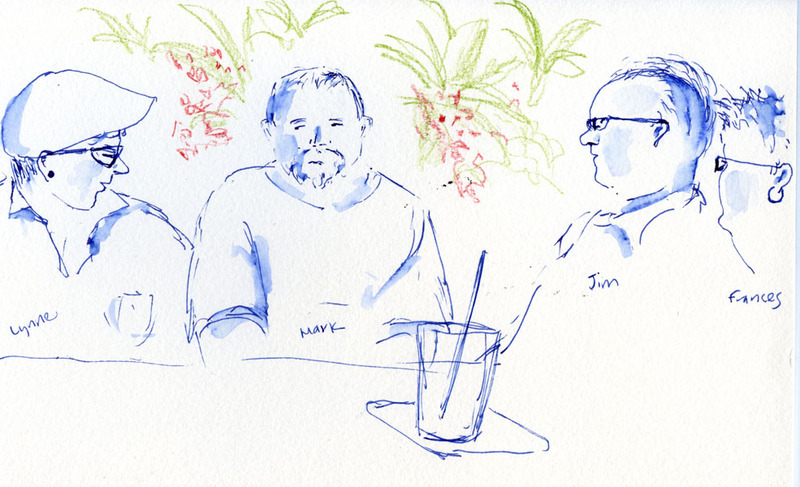 As soon as I had started sketching, I realized I had sketched it previously – almost exactly two years ago (the plants were different then, though). After finishing that sketch, I had a choice: Catch up with my party in the plant exhibits? 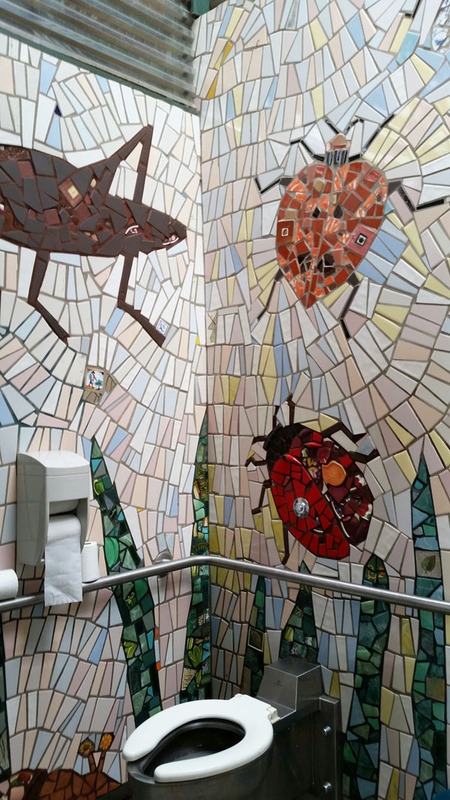 Or hit the small but well-designed zoo instead? It didn’t take me long to choose animals over plants. 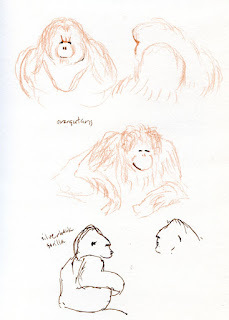 Although much tinier than Seattle’s Woodland Park Zoo where I sketch often, Como Park’s zoo has wonderful exhibits of orangutans and gorillas that I could see close-up. 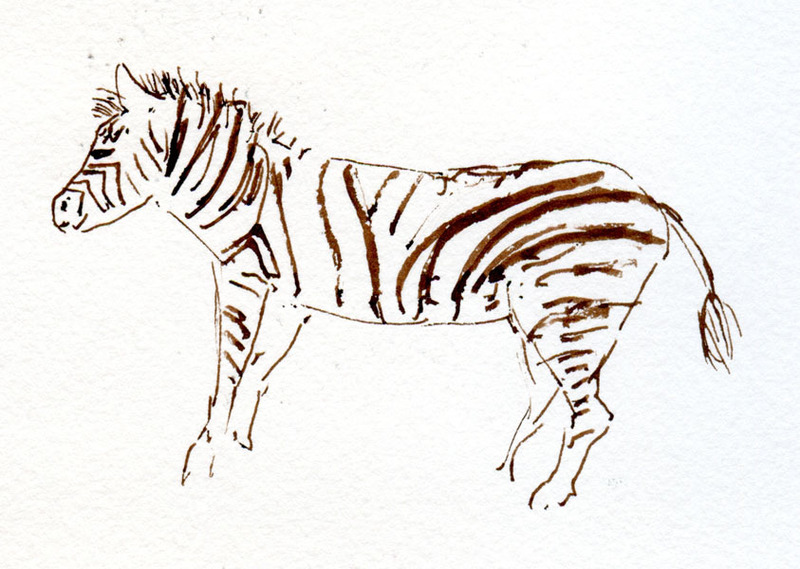 In addition, the zebra was close enough that I could sketch its pattern – something I’ve had difficulty doing at Woodland Park’s much larger African exhibit. 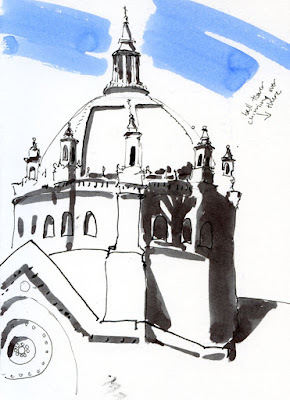 It poured most of the next day, so one of our indoor activities was visiting the Basilica of St. Mary in Minneapolis. 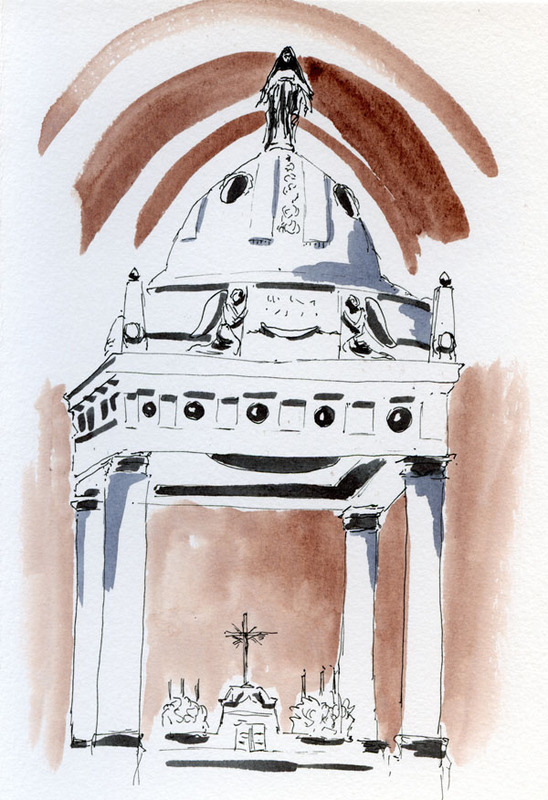 I’d love to go back sometime and sketch the exterior, but for this trip, I settled for the main altar. Escaping without a single mosquito bite, we’re back from a brief visit to the Midwest – the Twin Cities of Minnesota. 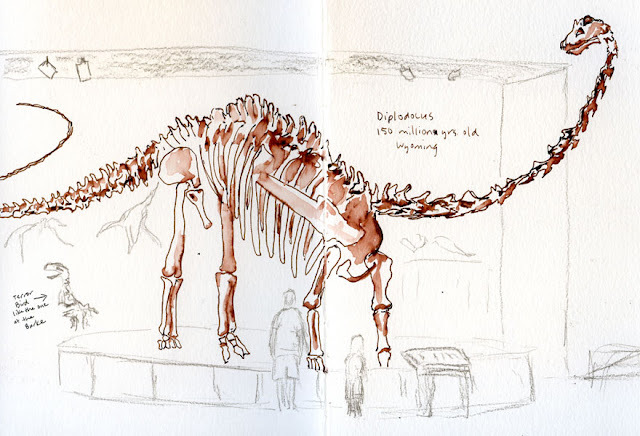 This annual trip is always a good mix of family visiting and city touring, so I always manage to squeeze in sketches wherever I go. 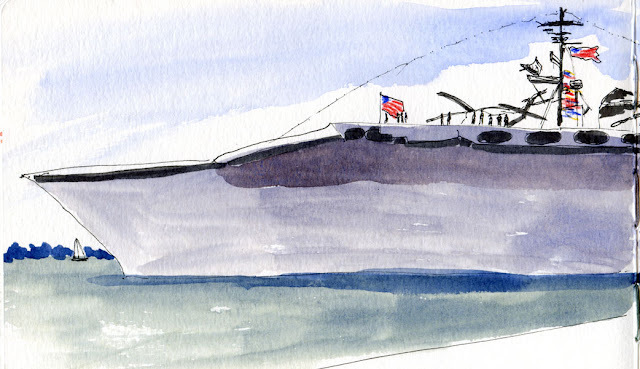 The biggest challenge this year was the weather – boiling heat with 100 percent (!) 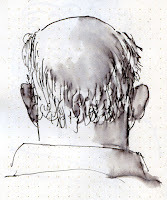 humidity on most days; a deluge on one other day. 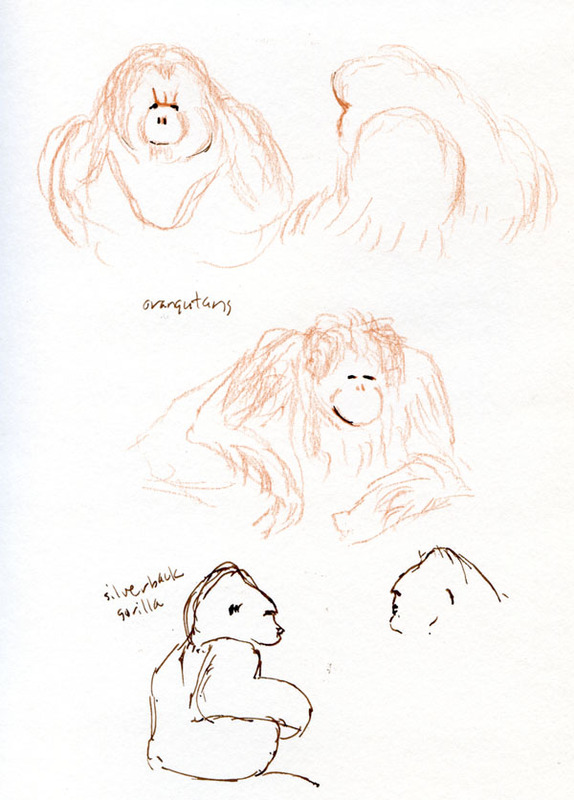 We spent quite a bit of time indoors evading both extremes, which turned out to be a sketcher’s delight. By that afternoon, the heat was unbearable, but I couldn’t see St. Paul’s Cathedral without a quick sketch. I found a spot of shade across the street, but after about 20 minutes, all I could manage was its elegant domed top before the heat got to me. 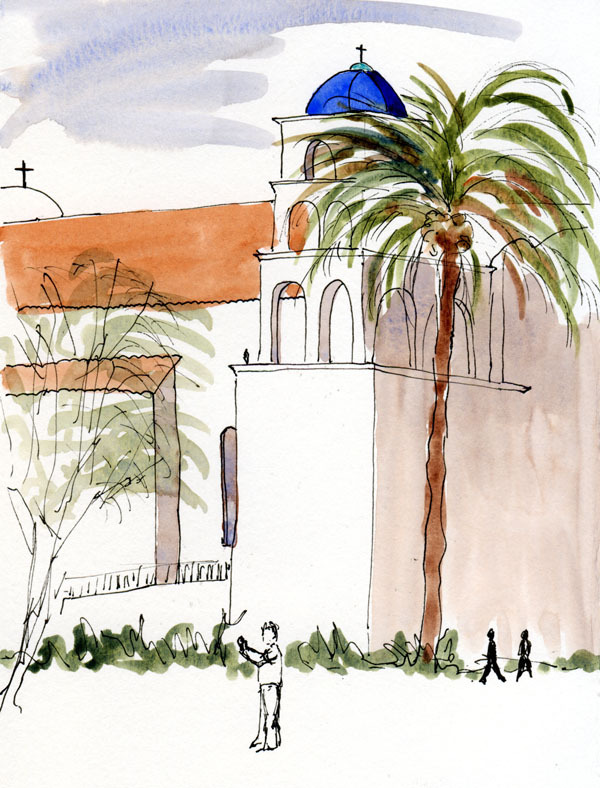 Someday I’d like to go back and sketch the whole cathedral – on a cool and comfortable day. Evergreen Washelli Memorial Park occupies both sides of Aurora Avenue North at around North 110th. 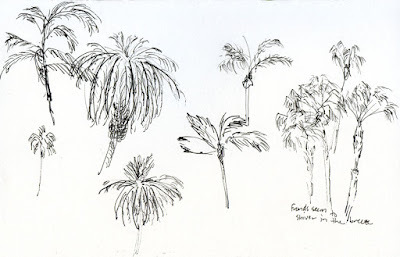 The last few times I sketched there, I stayed on the east side of Aurora. This morning I decided to explore the west side. Unlike the east side, which has an interesting Dough Boy memorial and angel statuary as well as a military section, the west side is relatively simple by comparison. 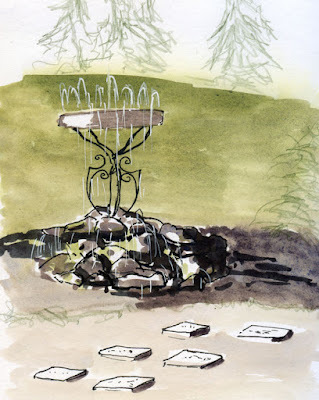 I drove around a while looking for a sketch, and down in a valley surrounded by trees, I spotted a small fountain. 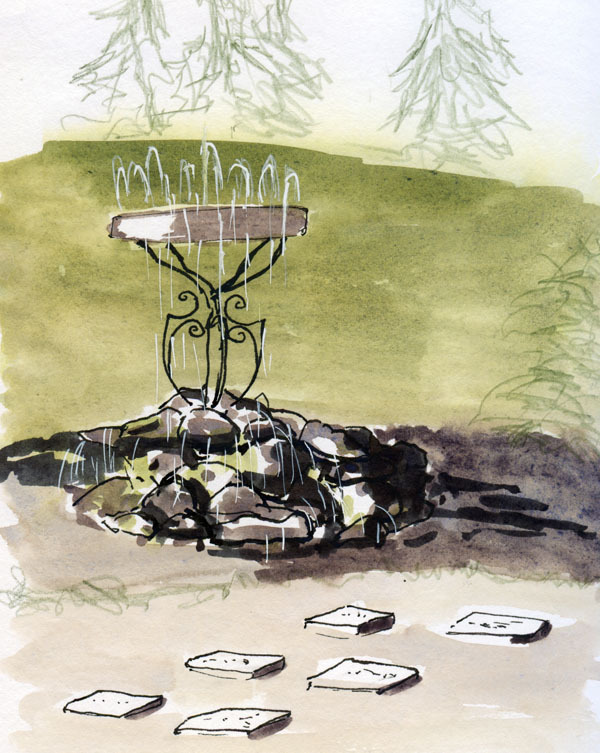 Mounted on a pile of mossy rocks, the fountain was pouring water into a somewhat murky-looking pond. Rows and rows of small, flat markers were nearby. Despite the heavy traffic on Aurora, the cemetery was serene. 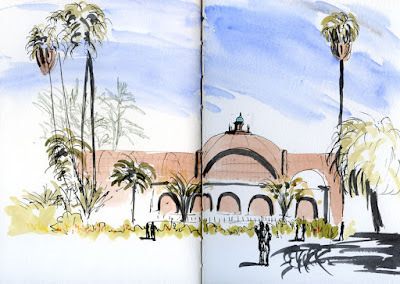 It’s become one of my favorite places when I want a quiet, undisturbed moment to sketch and enjoy the cool shade of large trees. Technical note: I’m really liking the Molotow white acrylic marker I had picked up impulsively at the Sennelier store. 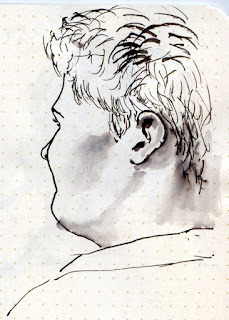 It works much more consistently than the white Uni-ball Signo gel ink pen I had been using, especially over watercolor. 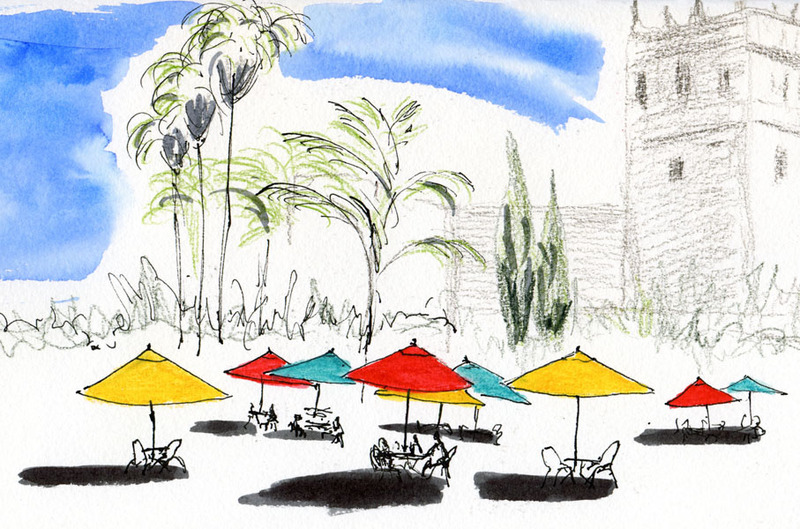 I don’t think I could have sketched the fountain’s water today without it. 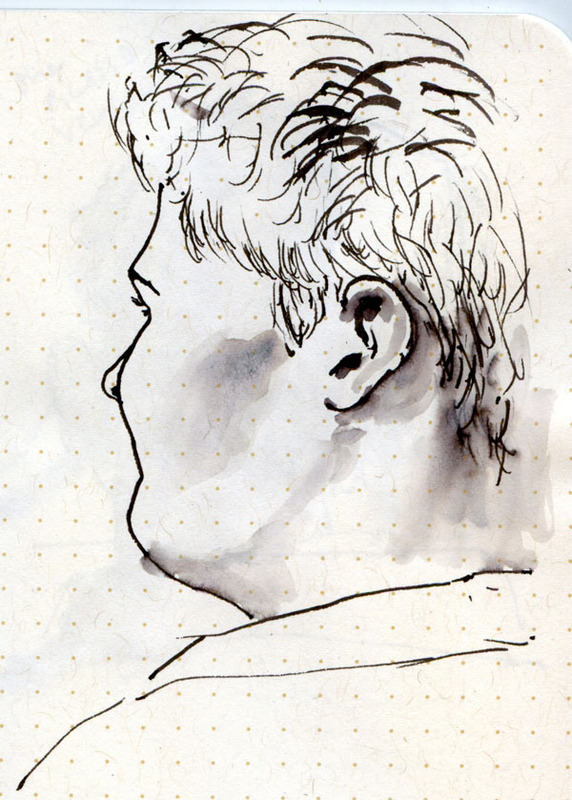 Occasionally I’ve talked about my goal to practice drawing daily. Actually, goal is not the right term, as that implies a result. I have no specific, measurable outcome (other than eventually improving my skills in the long-term sense). 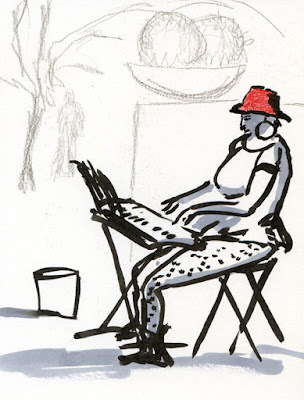 Drawing daily is more about a regular practice that forms a habit, or perhaps a lifestyle philosophy, like yoga. 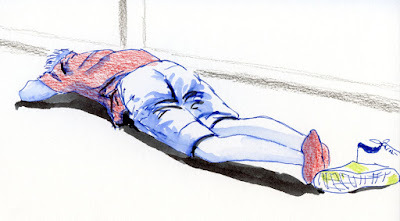 Every now and then I come across an essay about regular drawing practice that strongly resonates with me. Last September I read an excellent post by Chicago urban sketcher Alex Zonis that I noted on my blog, and I think it’s worth mentioning again today. And just yesterday I stumbled on an essay by Suzanne Brooker, a Seattle artist and instructor at Gage Academy. I haven’t met Suzanne yet, but reading her essay makes me want to take a class from her (and I probably eventually will). Here is what I call my “machete in the jungle” parable. If you think you can save up some time, like “I’ll draw for 2 hours on Saturday”, then you can almost guarantee it won’t happen because there is always something else more compelling that needs your attention. 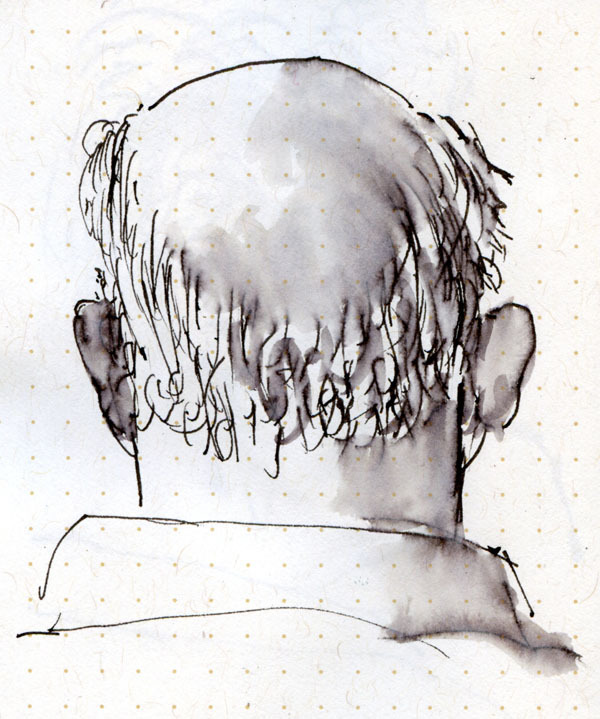 But if you spend 20 minutes a day drawing, then you are keeping the path clear by returning every day, otherwise the jungle grows back and you’ll spend your time just trying to get to the same place but not advancing. 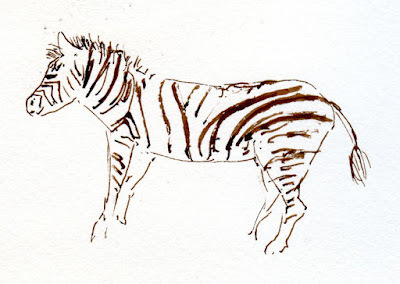 I haven’t necessarily drawn every single day in the past four years since I started sketching (although I think I have for at least the last two years), but I’m sure I haven’t gone more than two or three days at a stretch without drawing something (and believe me, my standards for “something” are pretty low!). For myself, I’ve found that an analogy with physical exercise is the most accurate: Even during those short stretches of not drawing, I noticed a backslide; just like skipping Jazzercise or yoga for a while, it takes me that much longer to feel limber when I start up again (and the pain is not worth it!). The longer I go without, the harder it is to get back to it. 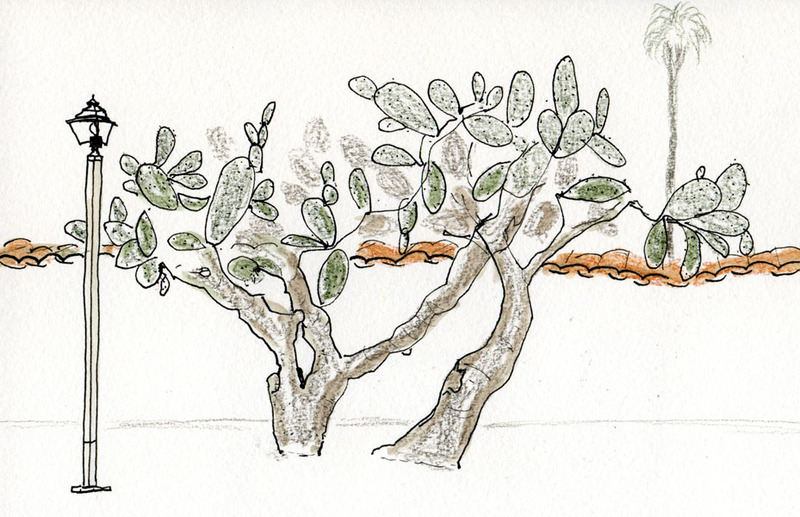 Now I like Suzanne’s machete-in-the-jungle metaphor, too. Hacking away daily, even for only a few minutes, is so much more satisfying and – at least in terms of eventual improvement – more effective than reserving a large chunk of time for concentrated effort (which may or may not come). Time to get out today’s machete. Technical note and travel musing: Pocket notebooks are often where my “daily machete” sketches go, especially on days when I don’t have time or the right weather to go out for the type of sketching I’d rather be doing (on location under a fair sky and mild temperatures). 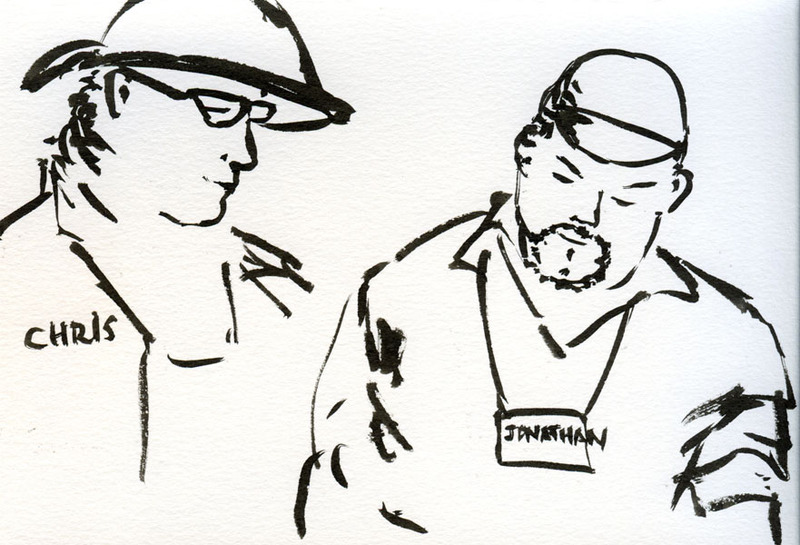 The subject matter for machete sketches tends to be people on buses, waiting in the same places I am, or attending a presentation or meeting. 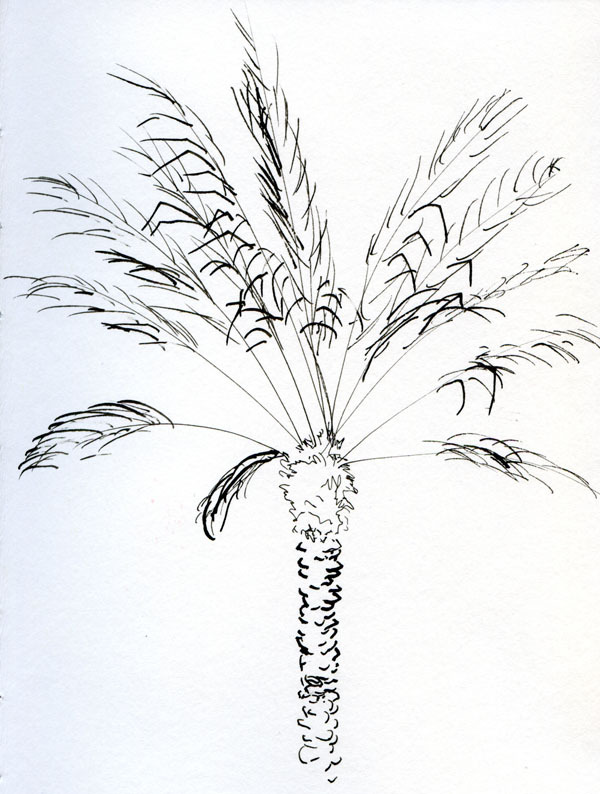 Occasionally it’s a not-too-inspired still life (and I use the term “still life” loosely; sometimes it’s nothing more than a pen on my desk). 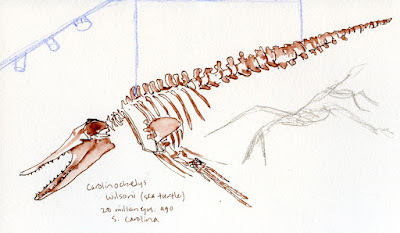 The sketches in this post were done in a Field Notes Workshop Companion edition notebook, which has lately been serving my daily-machete needs well (the Calepino notebook is running a close second). I like it so much that I’m even wondering if it might be able to replace my heretofore favorite travel journal, the Rhodia pocket notebook. 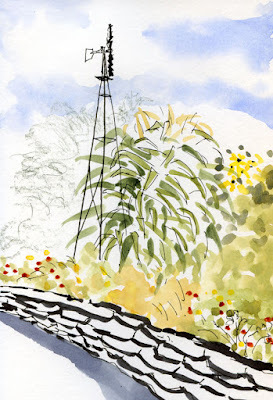 During my two weeks in France, I filled about 150 pages of the 192-page journal. Field Notes notebooks contain 48 pages, which means I’d want to bring at least three on my next two-week journey. I would prefer having the whole trip’s journal in one volume; on the other hand, my only complaint with the Rhodia is that it is a bit bulky, so splitting the journal up into the much-thinner Field Notes would resolve that issue. Hmmm . . . definitely something to ponder before the next trip. The last official sketch crawl was Sunday morning in historic Old Town, “the birthplace of California.” Except for the Church of Immaculate Conception, I wasn’t quite as inspired by the architecture there as I was at Balboa, so I focused on capturing some of the many types of palm trees and huge cacti I spotted everywhere. 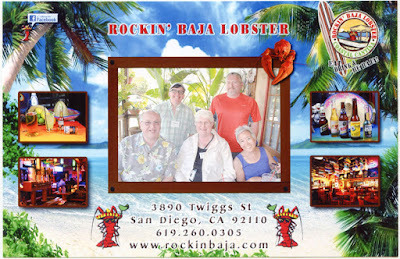 During lunch at the Rockin’ Baja Lobster Coastal Cantina (“Eat, Drink and Be Baja!”), we were given a free photo of ourselves to laugh at over our tasty but overpriced tacos. 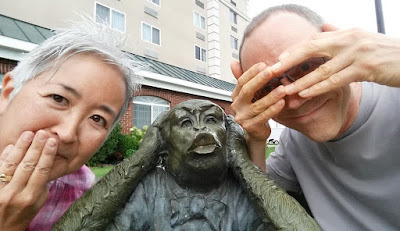 Refreshed, Mark, Lynne and I decided to catch the trolley to the scenic waterfront. 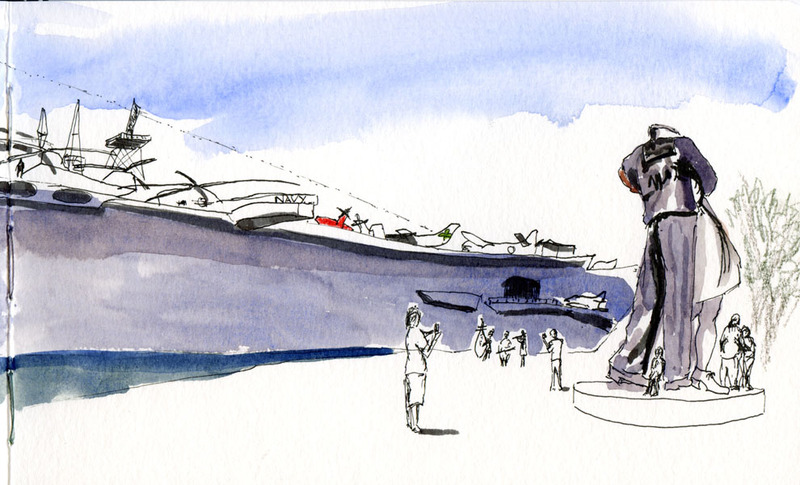 The highlight of my day was sketching the incredibly humongous USS Midway aircraft carrier, now a museum and attraction. 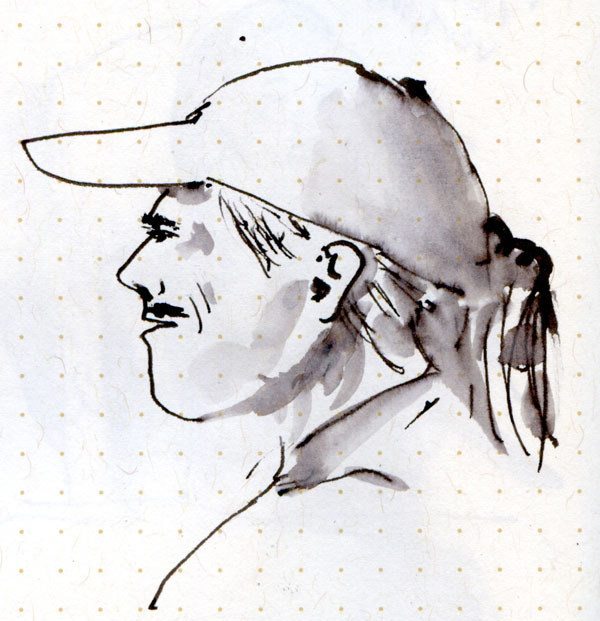 I wasn’t even going to bring my landscape-format sketchbook on the trip, but I’m glad I threw it into my roller bag at the last minute. Even with the full horizontal spread, I could barely fit the whole ship. 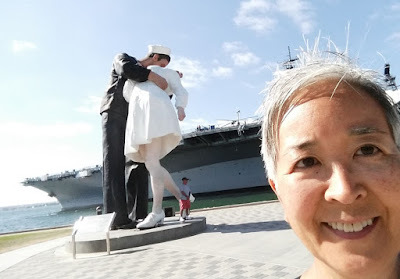 Right next to the ship is the 25-foot sculpture, “Unconditional Surrender,” inspired by the famous photo of the sailor kissing a nurse at the end of World War II. Ironically, even that huge sculpture is dwarfed next to the Midway. 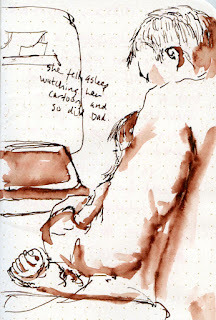 Of course, I couldn’t fly home without that mandatory airport gate sketch and some fellow passengers across the aisle: a little girl who dozed off while watching cartoons on her DVD player. Her dad dozed off even sooner than she did. 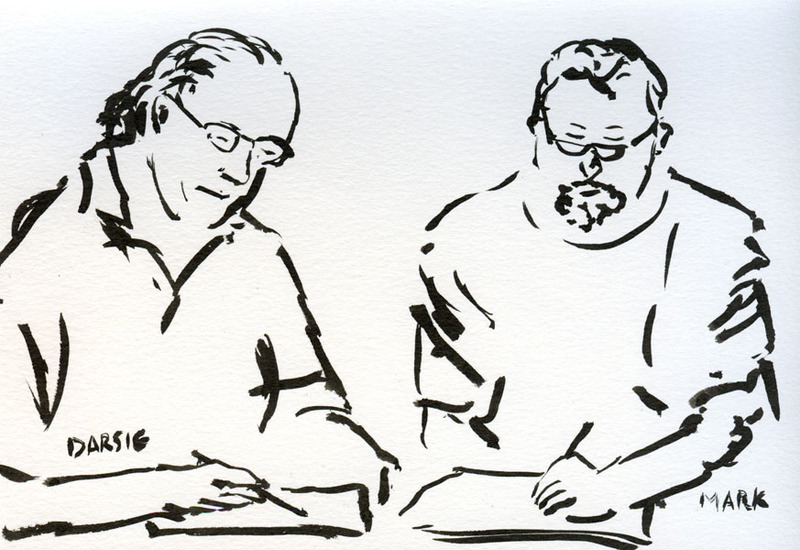 Next year’s Fourth Annual West Coast Sketch Crawl will be a little closer to home – in Tacoma! 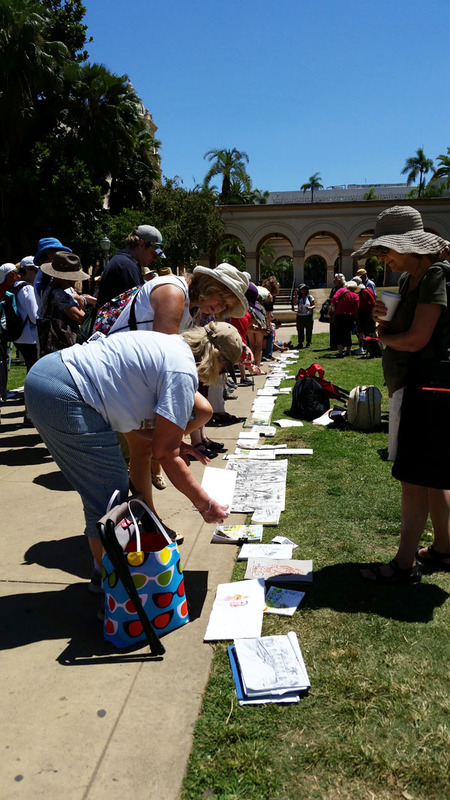 We’ll have a hard act to follow putting it together – the San Diego team worked hard all year and all weekend to give us a terrific sketch event! In case it's not obvious how large this sculpture is -- see the guy posing in front of it? 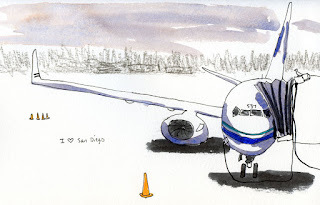 8/10/15 Aboard my flight home. Sketching my mandatory gate sketch at San Diego airport this morning, I didn’t want to go home yet! 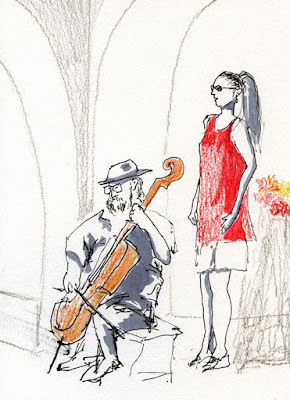 I had so much fun at the Third Annual West Coast Urban Sketchers Sketch Crawl that I wished I could have stayed several more days. 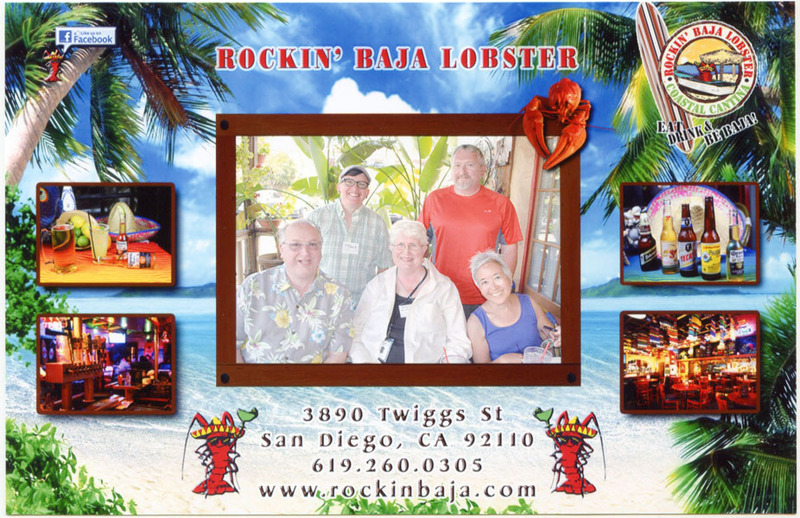 Everything you’ve heard about San Diego’s sunny weather is apparently true, and we had the best of it all weekend. The next day was the first official sketch crawl – a full day at beautiful Balboa Park. 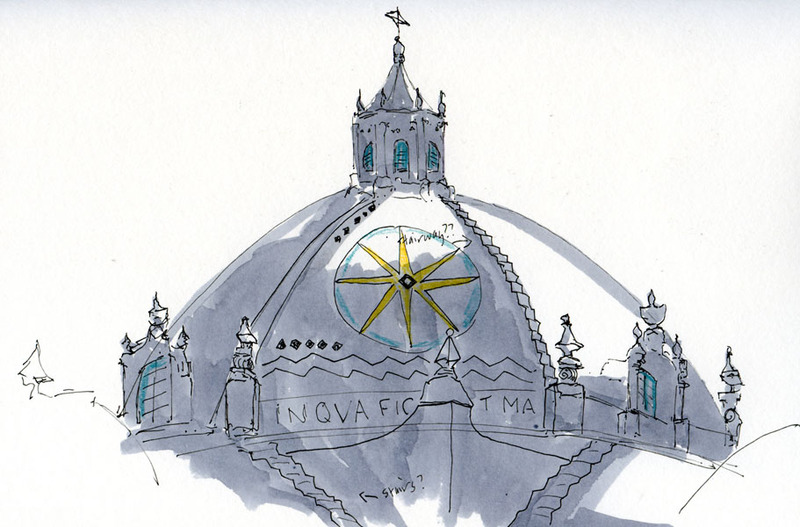 After spending eight hours there, I barely scratched the surface of amazing, sketchable architecture, gardens, museums, sculptures, buskers and so much more. 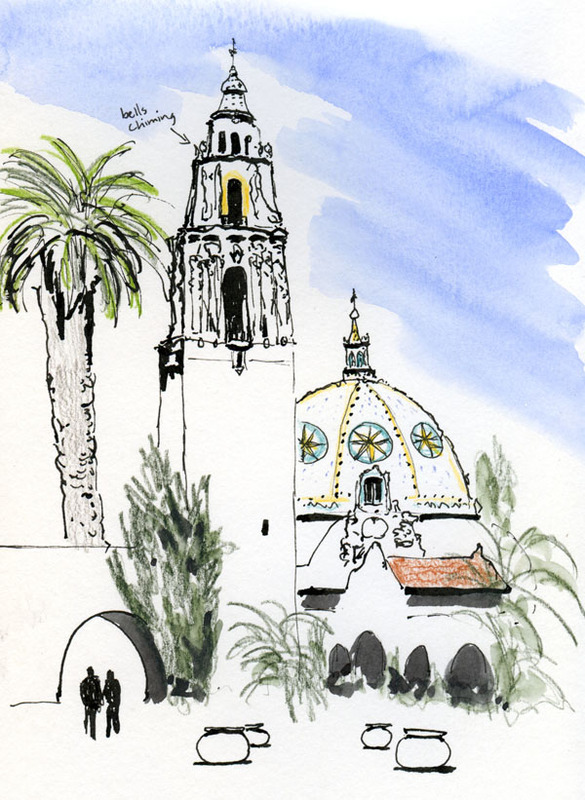 The icon of the day for many sketchers was the California Tower and adjacent domed San Diego Museum of Man (I liked that building so much that I sketched the dome a second time). Another popular icon was the Botanical Building. 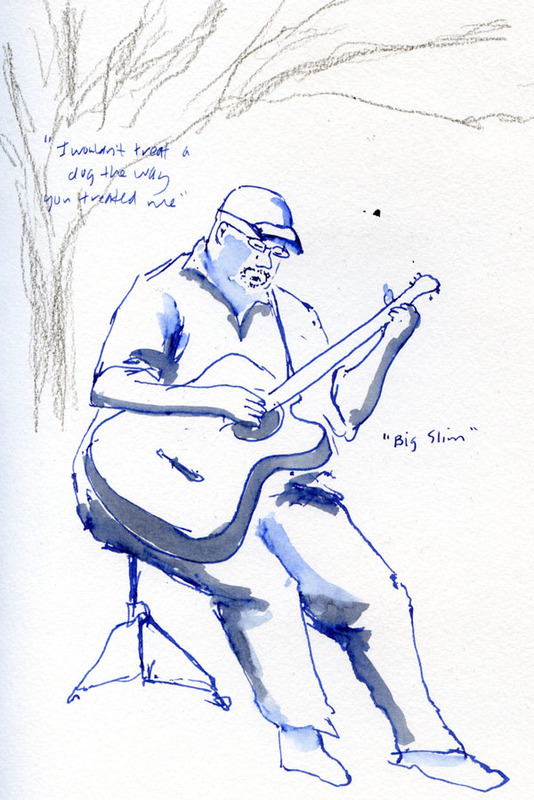 I got the tough architecture out of the way in the morning and spent most of the afternoon relaxing by sketching buskers. I think I heard that the official attendance count was 109! During the noon sharing (a second sharing happened at the end of the day), we made two long lines of sketchbooks filled with hundreds of pages of inspired work. To see sketches from all the West Coast Sketch Crawl participants, see the Flickr group. 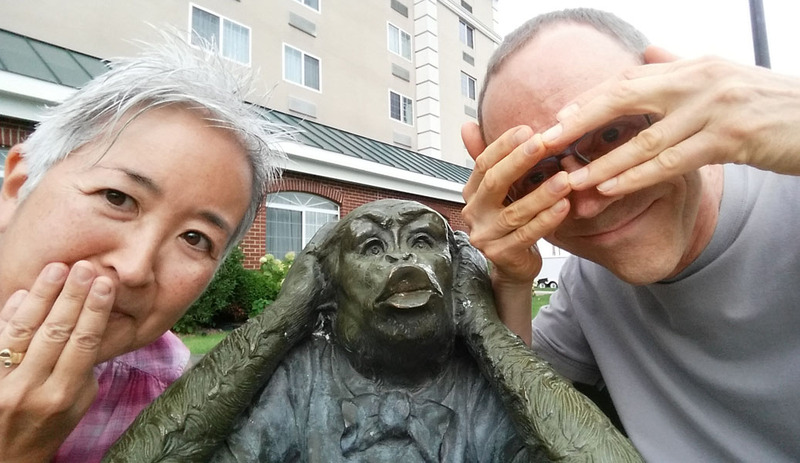 Stay tuned tomorrow for the Day 3 concluding event at OldTown, plus an ad hoc at the waterfront. 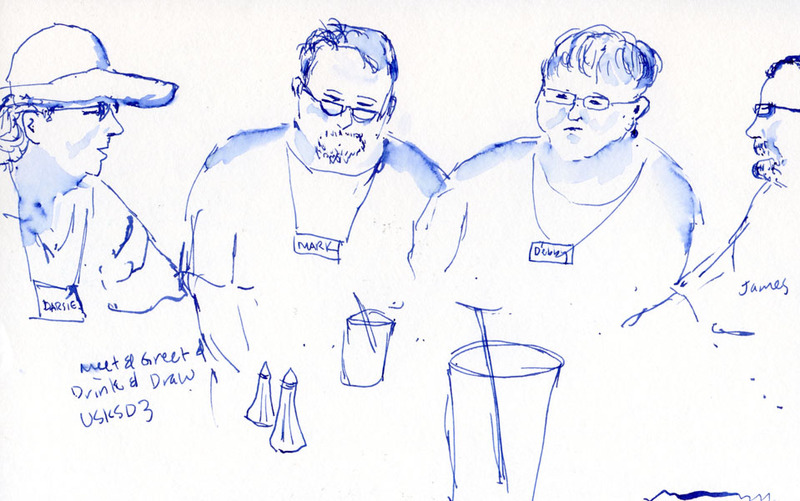 8/7/15 I didn't wait until the Portrait Party to start sketching people at my table! 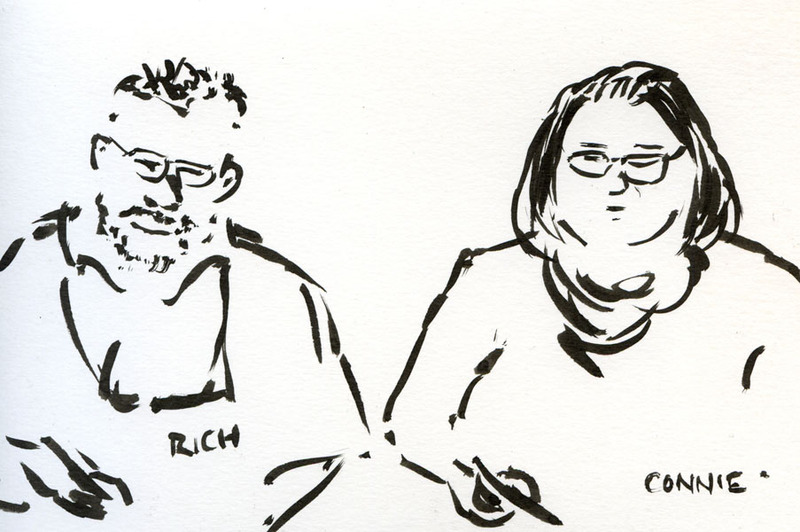 One of two rows of sketches during the noon sharing.